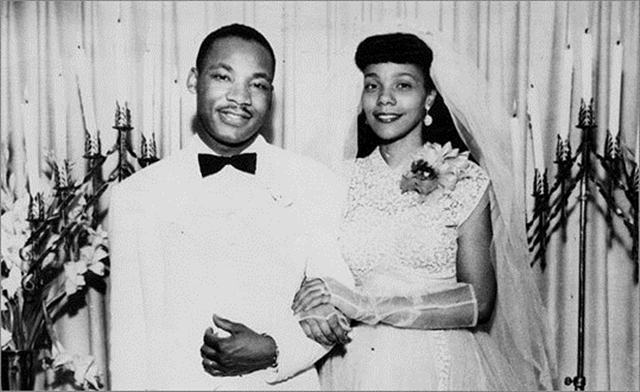 Dr. Martin Luther King Jr. (pictured to the right on his wedding day with wife Coretta Scott King) is arguably the most-iconic African-American figure of all time. The clergyman, activist, and Civil Rights Movement leader managed to postively impact race relations during one of the most turbulent periods in America. His tireless devotion to promoting racial equality via peaceful means stands as an indelible footprint in the annals of Black History. Today, Jan. 15, a few days before the country officially commemorates his life’s work and the undeniably significant impact on the United States culture, CTCUMC.org honors Dr. King on what would have been his 84th birthday. Born Michael King Jr. on this date in Atlanta to parents Rev. Michael, Sr. and Alberta, (both father and son would later change their name to honor the German Protestant religious leader Martin Luther). The middle of three siblings, King was involved early on in the church as a result of his father’s ministry. Although he initially shunned religion and the teachings of his father, he later concluded that the Gospel of Jesus Christ had value in his life. A capable high school student, Dr. King skipped grades and entered the famed Morehouse College at age 15, graduating in 1948 with a degree in Sociology. Later, he enrolled in Crozer Theological Seminary in Pennsylvania. King graduated from the school with a Bachelor’s in Divinity in 1951. Two years later, he would marry Coretta Scott – who would later become an icon in her own right. At 25 years of age, King would become the head pastor of the Dexter Avenue Baptist Church in Montgomery, Ala. The following year in 1955, King began doctoral studies at Boston University and received his Ph.D. in Systematic Theology. King’s dissertation was later found to be plagiarized and nearly derailed the scope of his academic work. Although Boston University investigated and later discovered the infraction, King’s doctorate was not revoked. King would find inspiration in theologian Howard Thurman, a former classmate of his father’s at Morehouse. Thurman’s mission work around the globe led him to meetings with noted Indian Civil Rights leader Mahatma Gandhi. Dr. King visited with Thurman, who served as his mentor, often. At the time, Thurman, who is said to have been key in delivering the message of non-violent protest to the young King, also served as the dean of the Marsh Chapel at Boston University. In 1957, the Southern Christian Leadership Conference (SCLC) was formed following the efforts and response to the “Montgomery Bus Boycott” in 1955. 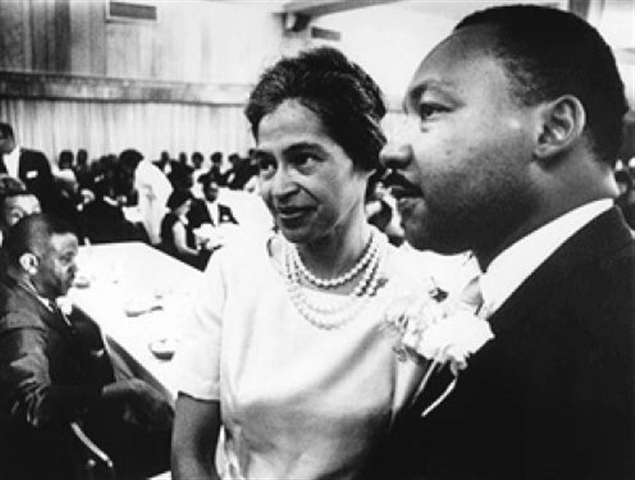 Rosa Parks (seen in photo left with Dr. King) jump started the Civil Rights Movement that same year, after refusing give up her seat to a White person. Dr. King and several other leaders joined the boycott, creating the SCLC. With the help of Quakers, Dr. King traveled to India in 1959 to visit with Gandhi. The trip was the necessary push needed to galvanize Dr. King’s desire to employ a similar approach with non-violent disobedience protests Stateside. SCLC activist Bayard Rustin, also a student of Gandhi’s teaching, served as King’s right hand in planning the 1963 “March On Washington” and was a trusted ally. On August 28, 1963, the historic March on Washington drew more than 200,000 people in the shadow of the Lincoln Memorial. It was here that King made his famous "I Have a Dream" speech, emphasizing his belief that someday all men could be brothers. Releasing just a handful of books during his lifetime, Dr. King’s written work contained nearly the entire scope of his personal and academic pursuits. “Stride Toward Freedom: The Montgomery Story” was released in 1958. His last work, “Where Do We Go From Here: Chaos Or Community” saw a 1967 release. During his life, King also became the youngest recipient of the Nobel Peace Prize in the fall of 1964, where he was recognized for his work in leading non-violent protests to combat racism during what some viewed as the zenith of the civil rights fight in America. On April 4 1968, Dr. Martin Luther King, Jr. would be assassinated by a lone gunshot as he stood on a hotel balcony in Memphis. Plagued for years by threats of violence, including a bombing of his home, Dr. King had long known that the dangers of his life’s work made him a target. Still, he fearlessly trudged on fighting on the behalf of the voiceless. President Barack Obama will be formallysworn in to his second term on the federally recognized holiday of King’s birthday on Jan. 21 (President Obama will be officially sworn in on Jan. 20 as mandated by the U.S. Constitution, in a private ceremony). Although the holiday was first observed in 1986, after President Ronald Reagan’s signing of a 1983 bill, it wasn’t until the year 2000 that all 50 states recognized the day. Martin Luther King Jr.'s life had a seismic impact on race relations in the United States. Years after his death, he is the most widely known African-American leader of his era, if not of all time. His life and work have been honored with a national holiday, schools and public buildings named after him, and a memorial on Independence Mall in Washington, D.C. But. like all human beings, he was not a perfect person. Over the years, extensive archival studies have led to a more balanced and comprehensive assessment of his life, portraying him as a complex figure: flawed, fallible and limited in his control over the mass movements with which he was associated, yet a visionary leader who was deeply committed to achieving social justice through nonviolent means. Perhaps it is his imperfections that make him such a perfect example to all of people - regardless of color or gender - who work each day to actively pursue the Christian Way. Thank you Dr. King for your dream, your work, your example and your sacrifice.